Seagrass meadows could be worth around €190 million every year to commercial and recreational fishing in the Mediterranean according to a new study by marine scientists. In a report, published in Conservation Biology, academics at Plymouth University and the University of Central Queensland, Australia, say that marine policies should consider the socioeconomic effects of the loss of seagrass, which provides habitat for many fishery species. Beds of seagrass play a fundamental role in supporting populations of marine species that are caught by commercial and recreational fishers, acting as nursery areas for juveniles, feeding grounds and refuge from predators. But despite protection from the European Union which bans the use of mobile fishing gear over the beds, seagrass is declining in the Mediterranean. Conducted under the EU’s KnowSeas project, the researchers used a ‘Seagrass Residency Index’ to give different fishery species a score based on how much time they spend in seagrass meadows at different life stages, compared with other habitats. The score was then combined with information on the economic value of seafood caught by commercial fisheries to calculate the total value of seagrass to this industry. For recreational fishing, the scores were combined with figures on how much is spent each year by anglers, for example, on equipment and transport, contributing to the wider economy. The results indicated that seagrass contributed between €58.3 million and €91.5 million per year to commercial fishing in the Mediterranean, between 2006 and 2008, at an average of €77.7 million. Approximately 4.5%, or €112.6 million, of annual angling expenditure could be attributed to seagrass meadows. 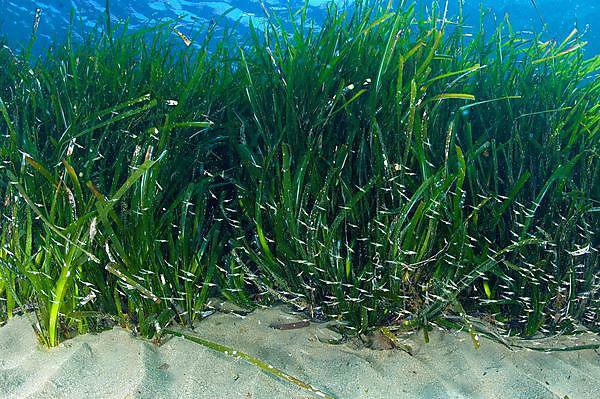 With seagrass (Posidonia oceanica) estimated to account for 5.5 million hectares, or 2% of the surface area of the Mediterranean Sea, it contributes a disproportionately valuable amount to fisheries in terms of ‘habitat service’. said Dr Sian Rees, a Research Fellow within Plymouth University’s Marine Institute. The EU’s Marine Strategy Framework Directive requires the cost of marine degradation to be determined. The full economic value of seagrass beds would be even higher than this calculated value if other ecosystem services were also accounted for, such as erosion protection and carbon sequestration, indicating how important seagrass habitat is to both the marine environment and human society.